Some of you may know that I originally had my own blog, Beauty but a Funny Girl, prior to joining Bookish (now Bookish Lifestyle). I was thinking the other day about all those reviews I left behind when I transferred and thought they should get some love too - no matter how badly written and newbie they come off! So I present to you: Throwback Thursday Reviews! Every once in a while I'll post an old review from Beauty but a Funny Girl, unedited in terms of content, with the exception of any spelling or grammatical mistakes. It's definitely going to be fun and interesting to see how my tastes and writing style have changed over the years! Because to make things right, they must travel back to when it all began ... and Lizzie discovers that the final events in her past life were more sinister than she ever imagined. Overall, I thought Timeless was a very nice wrap up to the Transcend Time Saga. The solution to Chelsea’s oops in Vengeance wasn’t a cop out and easily solved, which was really nice, though I would have liked the climax to have been a bit more climax-y than an “Oh, okay” vibe. I really can’t say more without giving it away. I think Lizzie and Drew have one of the cutest relationships I’ve ever had the pleasure of reading about. While they are in high school, I don’t get the high school relationship feel from them. All the characters are actually rather mature in this novel. I even grew to like Jeremy! Even though he wasn’t really in the novel, he had an awesome attitude about Drew and Lizzie being together - even asking Lizzie if she thought he had a chance with one of her friends! I was annoyed with Chelsea in the beginning of the novel, I mean who wouldn’t be? I have to give her a little bit of break because she wasn’t aware of what the repercussions of the curse would be, but I found her actions to be on the side of desperation. Chelsea had her own form of redemption when Lizzie informed her what the curse really meant and became determined to help Lizzie and Drew fix what she did wrong. I thought the magical element Madow used was a nice tough. It wasn’t overdone but it wasn’t so underused that there was no point in mentioning it. It was a very nice balance and fit the series very well in regards to the past-lives and curse elements that we’ve come across thus far. Everything fell nicely and easily into place for the characters. Perhaps a little too easily for my taste, but it stuck with the feel and tone of the series so it was rather perfect actually. This was such a great series and I loved reading every page of it. The characters were all well developed, even the minor ones, and the plot was original and intriguing. 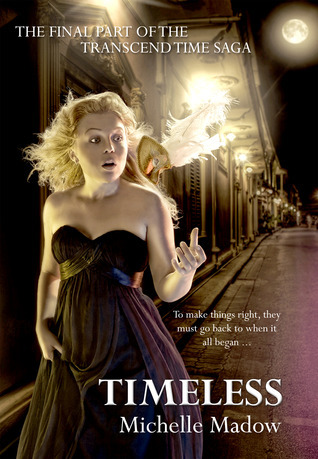 If you haven’t a chance to read Timeless, or begin the Transcend Time Saga in general, it’s definitely something you should consider moving up to to the top on your TBR list. I’m just saying.